This is always a question I’m asked by family and friends of those going through cancer. What do they need? What would be helpful? 1. 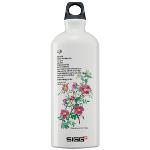 Stainless Steel Water Bottle – most people carry one with them to treatment or wherever they go. Find one with an inspirational message to help lift their spirits. 2. Journal – place to thoughts, notes, ideas, emotions, etc. Get a beautiful pen to go with it. 3. Tote Bag – to carry a book, water bottle, journal, etc. to while away the time spent in doctor’s offices, waiting rooms, etc. These are just a few ideas to get you started. Watch for upcoming blogs with more ideas.